When it comes to pool finishes, there are a variety of options. Each one brings its own set of pros and cons. In order to give you the information you need to choose the right finish for your Vancouver swimming pool, we have decided to explore the pros and cons of 5 common pool finishes. Plaster is the most common – and oldest – pool finish. It is made with a blend of cement, sand or marble aggregate and water. It is generally applied with a simple trowel, making it quick and easy to install. It is inexpensive compared to most other pool finishes. It gives the quintessential classic pool look. It can be dyed a variety of colours. Trowel marks can often be seen in the finish. If your water is not properly balanced, it can be damaged. It only lasts 5-10 years. While plaster has a lot to offer, the modern look for pools is moving towards finishes that offer more style and can be incorporated into an overall backyard design. Vinyl liners are another popular pool finish. Like plaster, vinyl liners create a classic pool look. While they are not the most stylish option, vinyl liners are functional and tend to be seen as family-friendly. They can be easily refurbished. They have issues with algae growth. Unbalanced chemicals can cause them significant damage. Like plaster, vinyl liners do come in a variety of colours. There are a variety of tile finishes out the, including porcelain and glass. In terms of look, there is almost an infinite number of tile colours, glazes, textures and designs to choose from. On top of that, you can mix-and-match various tiles, creating a unique, custom look for your home pool. If you want to set your creative side loose, this could be the pool finish for you! With the right tile choice, it can be highly resistant to chemical damage from unbalanced water. It is the longest-lasting finish. There are a variety of style options. Glass tiles do not stain. Tiles can magnify light, creating a shimmer effect. It can have sharp edges if not properly installed. Tiles can chip or break. Aggregate is the modern version of the plaster pool finish. Essentially, aggregate finish is like plaster, but with other material swapped into the mixture instead of sand. This material can range from pebbles to quartz to glass beads. Whatever is mixed in creates a pattern in the final finish, adding texture and depth to your pool finish. When working with aggregate, it is important to decide if you want an exposed look, where the blended material is whole, creating a rough surface, or a polished look, where the material is sheared down to create a flat surface. It lasts longer than plaster. You have a choice of a flat or textured surface. There are a variety of looks you can create. It is more resistant to chemicals than most other pool finishes. Exposed aggregate finishes can be rough and difficult to walk on. Glass beads can fade within a few years. While Hydrazzo is technically a form of aggregate, its superior quality and appearance places it in its own category of pool finishes. Hydrazzo is created by blending crystalline, coloured marble, white Portland cement and performance-enhancing ingredients. After Hydrazzo is mixed and installed, it is hand polished, creating a natural radiance. It is the smoothest aggregate finish on the market. It is made with an all-natural blend of materials. There are a variety of colour options. It resists algae and scale adhesion. It is a luxury option, so it is more expensive that pool finishes like plaster. If you are looking to create a unique, extraordinary design, Hydrazzo is the pool finish for you. Once you have chosen the pool finish that is right for you, the next step is to incorporate it into your overall design. Ready to begin this process? 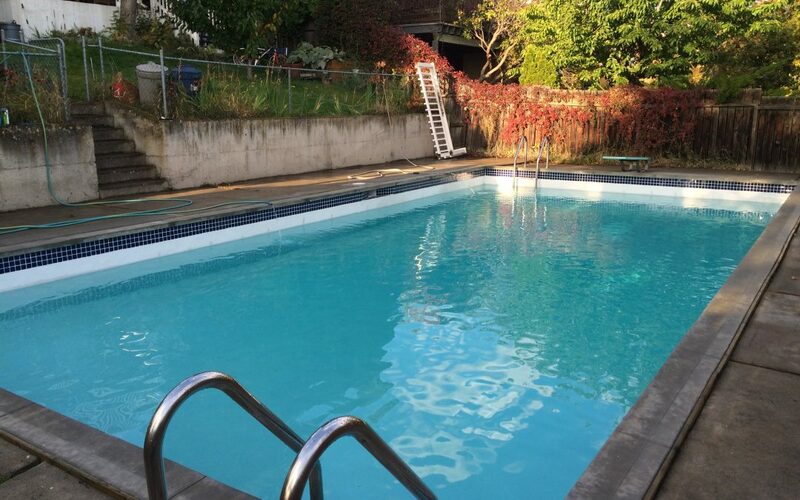 Get in touch with our Vancouver pool builders to receive a quote for your custom pool installation.